I have fond memories of Swords & Soldiers from years back and it is now gracing the Nintendo Switch! Is it new and improved? It doesn’t look too different from what I remember from the Wii U days when they updated the graphics to HD. It’s a 2D, side-scrolling, RTS-Lite, Strategy game still. That being said, there’s a bit of content for the price and the local multiplayer is still a ton of fun! It was good to get back into grinding gold and pumping out units and now I get to defeat my children since they’re old enough! 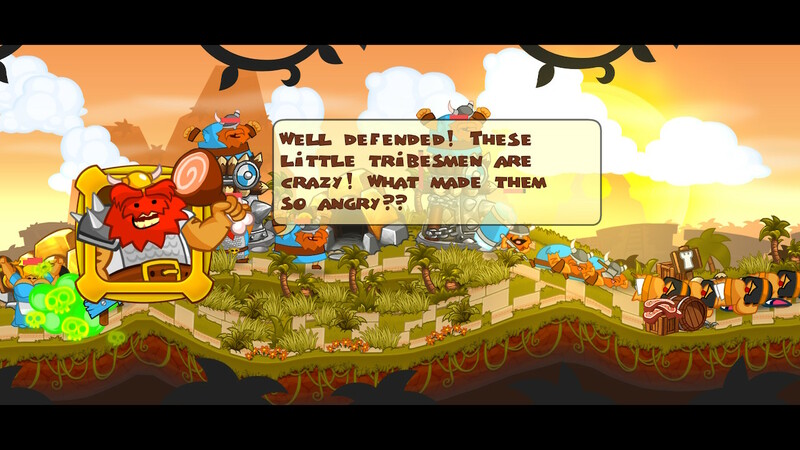 However, with Swords & Soldiers II: Shawarmageddon coming out soon, is it still worth picking up? Let me break it down for you. 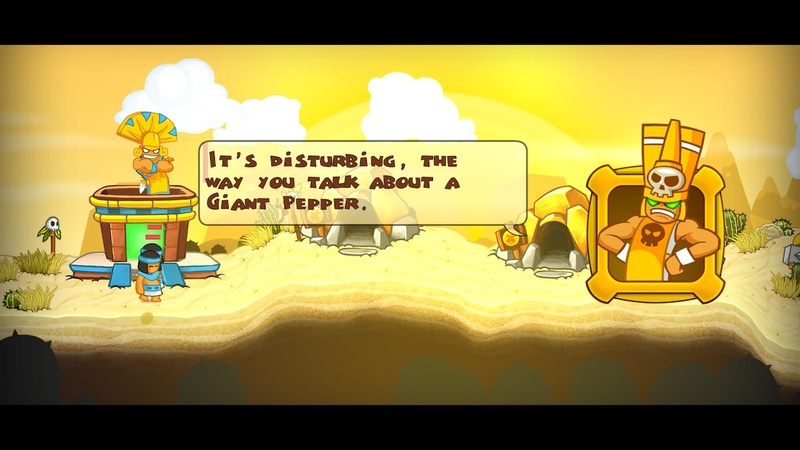 It’s an actual giant pepper they’re talking about folks; get your mind out of the gutter. There are four campaigns to play through and while there are similarities between them, they all play differently. It’s a story of barbecuing, stealing vegetables and taking “toys” from other people (and even a smidge of cannibalism). It’s rather humorous, but the best campaigns were the Vikings and the Aztecs. That’s a shame since one of the last campaigns is the Chinese. That’s not to say it’s bad or boring, but it wasn’t as fun. 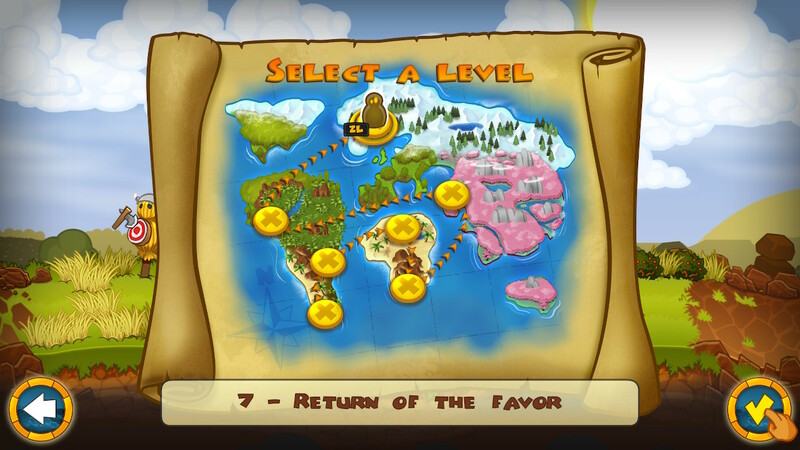 Most of the levels are pretty basic while some rely heavily on using a specific tactic to teach you how to play the game (par for the course). You’ll jump into this mode for the entertainment value which is a well crafted and goofy story line. It’s worth your time. I can’t lie though, the real fun is in playing against someone else. You know, I may say the campaigns are simple in concept, but the difficulty really got me near the end. In the multiplayer you have three options: Vikings, Aztecs and the Chinese. The Vikings are the most straight forward of the three. They consist of units that walk across the map with no real flare, but have a bit more brute force behind them and they can be healed. Catapults help support the front-line units as well as take out on coming hordes from your adversaries and their buildings with much ease. With some of the research being dedicated strictly to mana regen, your special moves are more easily used with regularity (heal away!). On top of that, the Rage move helps get your units to the front line faster by bunching them up and rushing them forwards (careful though, as AOE eats them alive). 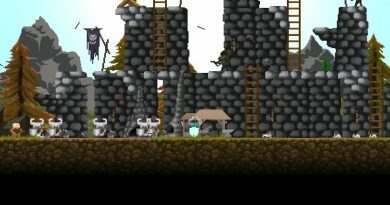 The Vikings can also build towers that can be manned with Axethrowers. This is definitely the race I’d suggest if you’ve not played the game before. As a meat lover, I can get behind these guys… minus Chief Meat’s willingness to get the shakes when he’s hungry. The Aztecs are more of a death-ball based team. You can build a mass of guys behind their Sun Giant (as it acts like is a tank) but the strength seems to be in the mass amounts of units that can be created by the Necromancer. He’ll raise all of the dead bodies in his path (from both teams) and create a skeleton army. Without AOE, your opponents will have a hard time taking them out. The Statues (Aztec towers) you’ll construct will slow down the opposition as well as they shoot lasers from their eyes (it’s rather cool). The kicker here is the timing. The Sun Giant is a great unit to have in the front, but he’s super slow. Create your path of destruction with your Necromancer bringing up the rear and you’ll have some fun. Your skeleton army can’t be alone as they don’t have a lot of health. One of the best uses for them is sacrificing them for mana if you spare them. The Aztecs have a slow trickle of mana and the only way to get more is by sacrificing your own units. The more health a unit has, the more mana you get for it. Gather enough and you can summon a huge boulder that literally crushes your opponent units and breaks down towers. Just make sure you jump it over your units because it turns out that even if a giant boulder is on your team, it still hurts. Just rolling on through with my skeleton buddies… nothing to see here. Last, but not least, you’ve got the Chinese. With teleporting, Ninja Monkies that stun and Zen Masters with wicked mustaches that force-choke their enemies, the Chinese have some really cool units that make me wish I was a lot better at playing them. (I’m currently stuck on one of their levels…) The towers they build are Buddhas that generate mana. This is great if you can get some territory to build multiple statues. With the mana you generate, you can duplicate your units and give them Magic Shields. It’s a balance on whether it’s cheaper to duplicate your units with mana than it is to buy them with the gold you mine, but it also costs more mana to duplicate the nicer units (obviously). If you save enough mana, you can summon Shenron a giant fire-breathing Dragon. I think the most fun tactic is to have an army of old dudes that force choke everything in their path. The only bummer is that they do no damage to the enemy base, but they can completely stop production of everything. I’m up in the air on a great (legitimate) tactic with them unless I’m really ahead (which counts for nothing if I can’t get there in the first place). The story isn’t deep, but it’s funny and worth going through at least once. 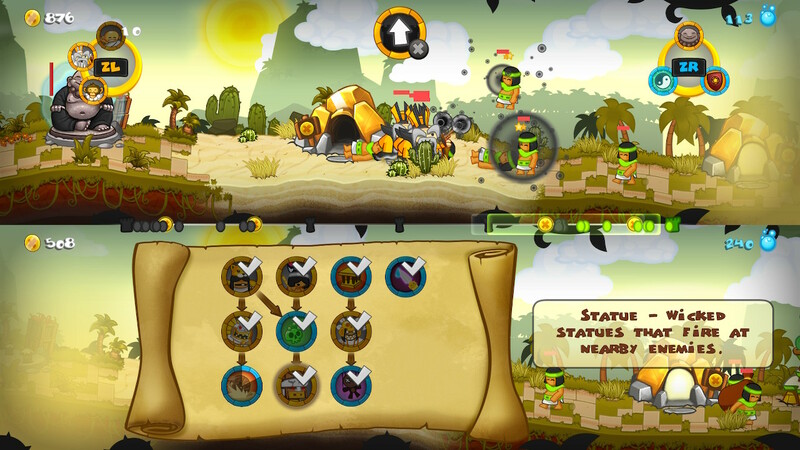 The multiplayer is what really shines for Swords & Soldiers. While the A.I. isn’t nearly as fun to beat as real people, the strategy aspects are more than a welcome addition to my Nintendo Switch library. The amount of differing units may not be staggering for each faction individually, each faction does have unique units that really stops the cookie-cutter feeling which is fantastic for an RTS-lite strategy game. Even if you’re planning on picking up Swords & Soldiers II: Shawarmageddon, the sequel has different factions and will play differently because of it. At the price, picking up both of these games is easily a no-brainer if you enjoy the genre (even if it’s simply to support the devs).